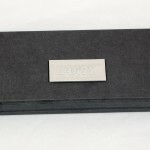 Once people finally venture into the world of the $100+ fountain pens, one of the most commonly recommended (and subsequently, acquired) pens in that range is Lamy’s flagship pen, the Lamy 2000. First introduced in the mid-1960s, this Bauhaus-inspired modern design has been around for decades, and even has a permanent place in the Museum of Modern Art. Despite its frequent recommendation and easy availability, I had never purchased the well-known icon of fountain pendom. I’m not entirely sure the reason for this. 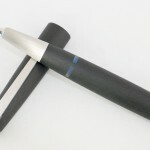 It may have had something to do with the fact that I’m not a fan of the omnipresent Lamy Safari (or its kissing cousins, the Vista and the AL-Star), despite glowing recommendations from them all over the web. I found them to be only decent writers (aside from one nib that I found to be horribly scratchy), and to both look and feel cheap and childish. 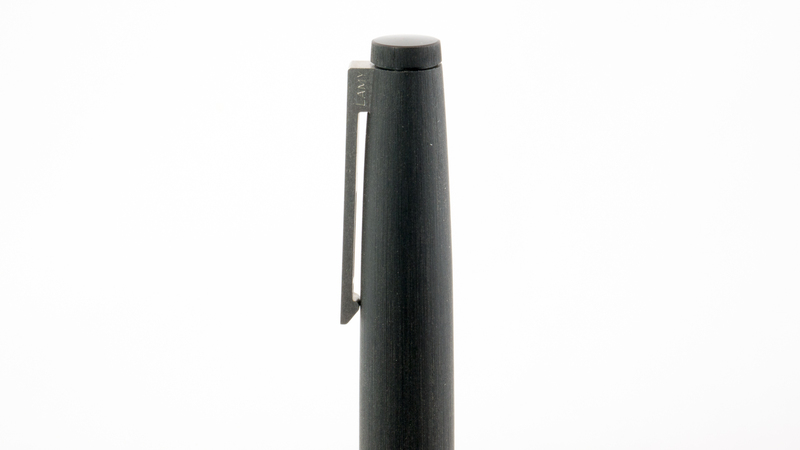 That alone probably kept me from venturing into the Lamy 2000 world for a long time. If the Safari, such a beloved pen, was so disappointing to me, how in the world would I feel about a $150 pen from that same company? I’m a big enough man to admin when I’ve made a mistake, though. And in this case, I was wrong. 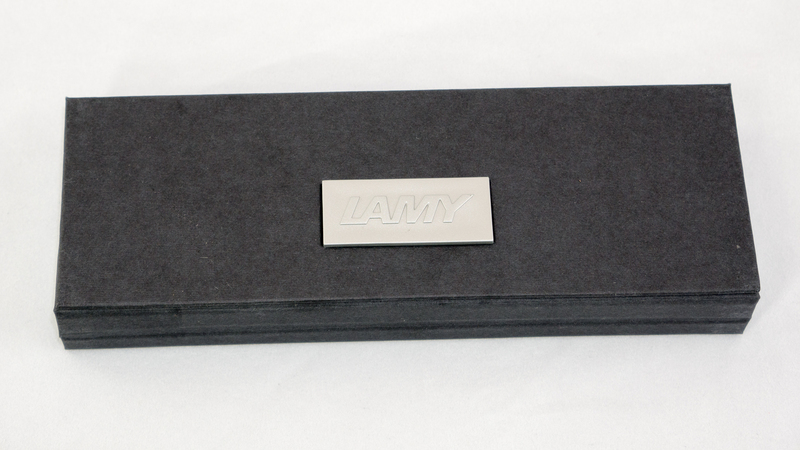 The Lamy 2000 I reviewed was sent to me by Rob to review before sending on to him. And before I had even emptied out his pen to send it back to him, I had purchased one of my own. 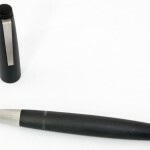 The cap is held on with two little metal tabs that protrude from the side of the pen’s barrel. These tabs could potentially fall under your grip depending on how or where you hold the pen. They do not impact my grip, however, and don’t bother me in any way. (More on the grip in a moment.) 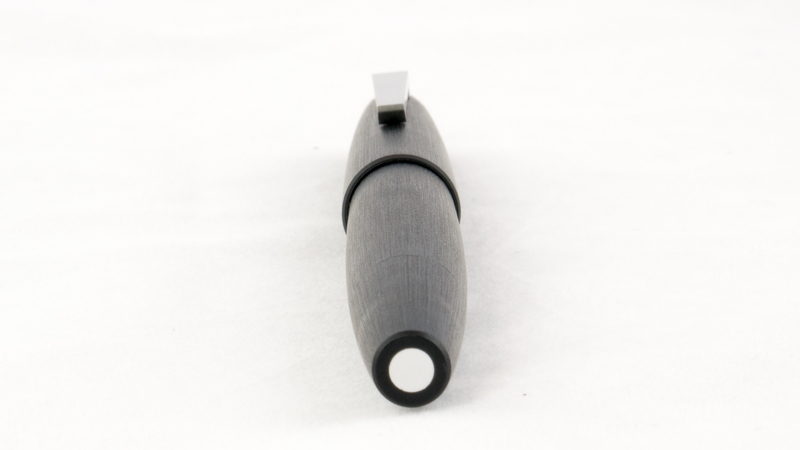 The top of the cap is polished to a mirror shine, and the brushed stainless steel clip is spring-loaded and can be opened by pinching the very top of the clip, making it easy to insert into a shirt pocket. 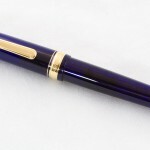 One of the things that impressed me most about this pen, however, is that, due to the gently sloping barrel, and the complete lack of any threads, step downs, or other obstacles, it is possible to hold this pen pretty much any way you want, and to get any diameter grip that feels comfortable to you. I prefer a grip that sits around 10-11mm, so I hold my pen just slightly above the tabs on the side of the barrel. 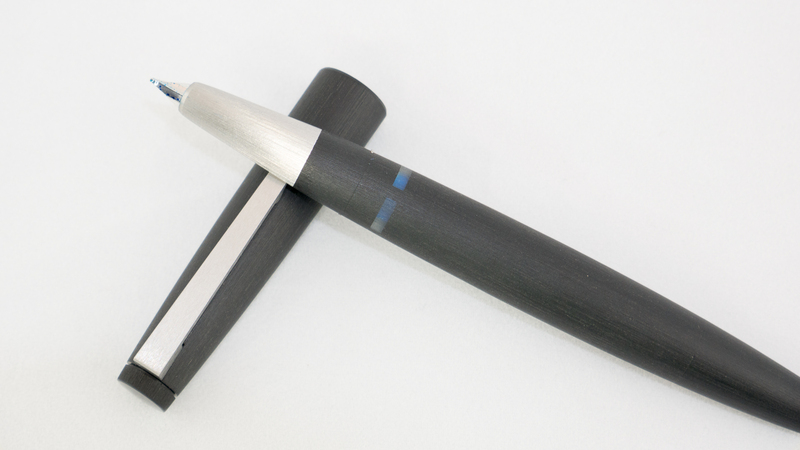 If you like a narrower grip, you can hold the pen closer to the paper on the brushed metal section. 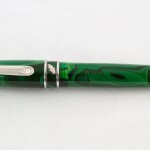 This universal grip may be one reason why so many people enjoy writing with this pen. It truly is almost a one-size-fits-all design. At $150, the Lamy 2000 comes with a couple of features that make it quite the value, and are uncommon on pens in the same price range or even higher. First is the fact that this is a piston-filler pen. 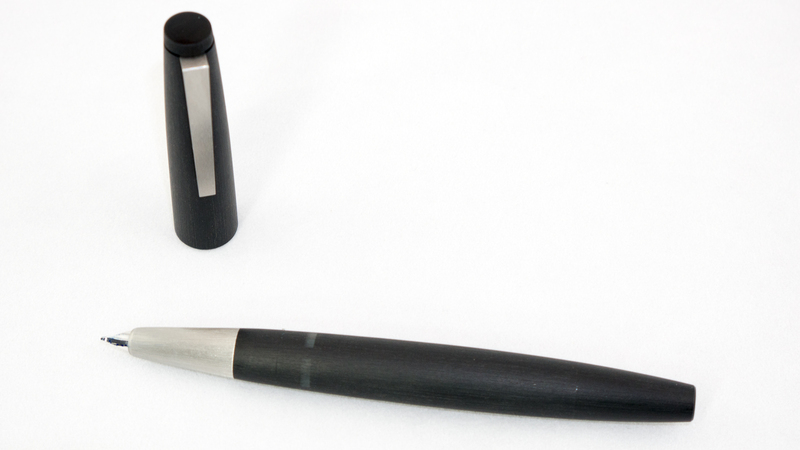 The piston knob is, as I mentioned before, so well assembled that it nearly disappears into the barrel of the pen. The filling system also results in a larger ink capacity than most cartridge/converter pens. The barrel has four frosted ink windows that can give you an idea of how much ink is still left in the pen. The fact that the Lamy 2000 also comes with a Platinum-plated 14k gold nib is also pretty spectacular at this price. 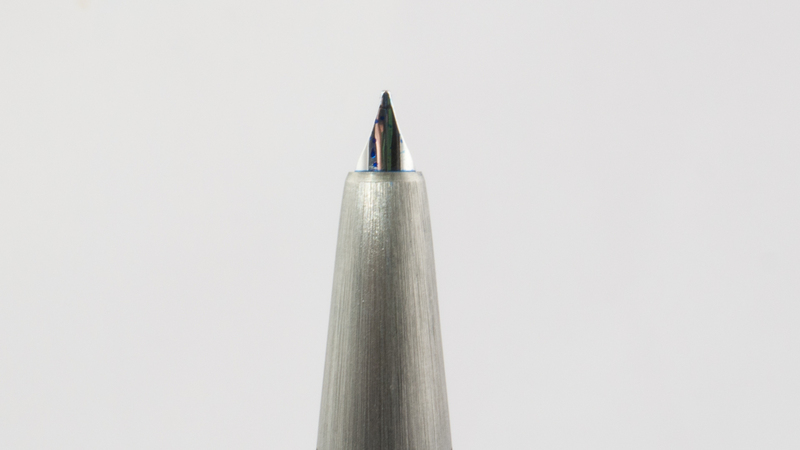 The nib is semi-hooded, and does a good job of continuing the tapering line of the pen all the way down to the nib tip. The nib is ultra-smooth. 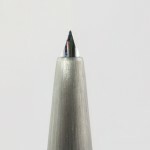 In fact, as I mention in the above video, it is one of the smoothest nibs I have ever used right out of the box. Despite the fact that it is smooth, Lamy appears not to have fallen into the same trap that many other modern manufacturers have by over-smoothing their nibs to the point of a wicked baby’s bottom problem. I have had nary a hard start or a skip due to an oversmoothed nib. The ink flow is medium-heavy, and thus far, I have had no instances of the pen being unable to keep up with writing over a long period of time. 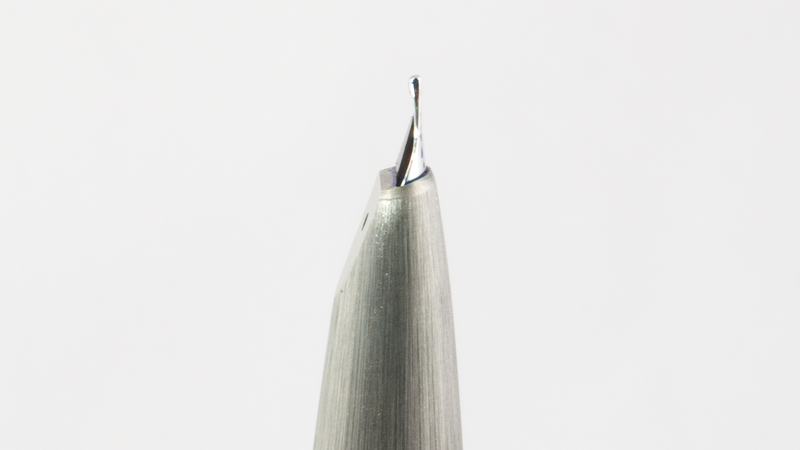 One of the most common complaints that I heard about the Lamy 2000, and the main reason why I held off on buying one for so long, was that Lamygrinds its nibs in such a way that the pen ends up having a very small sweet spot where it will write properly. I did not find this to be the case. Perhaps it is the way I hold my pen and the angle to which I put my pen to paper, but I didn’t have any issues at all with being unable to find the sweet spot. That being said, after playing around with different grips, and trying to determine where the basis for that complaint might be, I think I have a bit of insight. 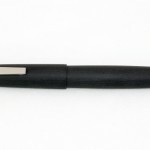 Since the Lamy 2000 is such a non-ornamented pen, since the nib is semi-hooded, and since the nib is completely without any visible decoration, it is sometimes difficult to determine if are “rolling” the pen laterally when you write. I used to roll my pen to the left when I wrote (I’m right-handed) so the top of the nib was facing me a bit. I’ve worked rather a lot over the last few months to rid myself of that habit…especially as I am starting to spend more time with my flex-nibbed pens. 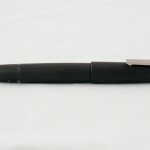 As a result, when I picked up the Lamy, my grip kept the pen from rotating in either direction. Though, by looking at the nib from the writer’s perspective, I would have been hard pressed to tell you if the pen had been rotated or not. When I, for testing purposes, rolled the pen as I used to do, I started having all kinds of issues with the nib not writing at all. In the writing sample in the video above, you can see what happens while I roll the pen from side to side while drawing a horizontal line. The pen just stops writing once the nib is rolled past a certain point on both sides of the nib. 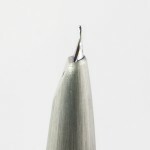 Now, this will happen with almost any nib, but it is likely this lateral rolling that some users feel results in a sweet spot that is “too narrow.” I don’t feel this way personally, but if you roll your pen a lot, then you may experience this issue as well. In the end, however, I found the Lamy 2000 to be a beautifully-made pen from a nice material. The mid-century modern design is clean and understated without being boring or derivative. The smoothness of the nib, the larger ink capacity, the convenience of the pop-off cap, and the wonderful, tactile feel of the Makrolon material make this a pen a like a lot. And, unless someone had told me, I never would have guess that this pen came from the same company that created those garish, ugly Safaris. The 2000 is a wonderful pen, and one that I’m sure I’ll use a lot over the coming years.